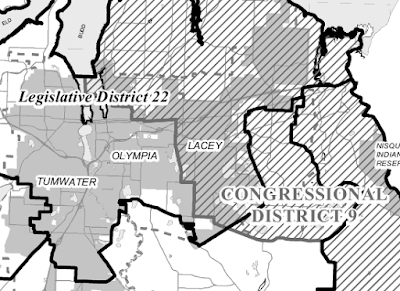 Though Politico first called the WA 3rd an "Olympia area district" when this entire replacing Baird drama started, its quickly sussing out to be all about Vancouver. Or near Vancouver. With all due respect to Cheryl Crist, that Brendan Williams held onto his hat yesterday put the final nail in the coffin for any major influence Thurston County liberals will have in this election. And, even though Denny Heck graduated as a geoduck and now lives in Olympia, the last people who successfully elected him to anything were in the 17th LD. Q. What was your proudest accomplishment during your years in politics? A. The Tuition Reciprocity Act, which allowed people in Clark County to attend Oregon state universities at resident tuition rates. There was no publicly supported four-year college or university within commuting distance. You could go to Clark College, which I did, but if you were place-bound, you could not complete your college education unless you could afford the non-resident tuition rates at Portland State University or the private college rates at University of Portland and Reed College, etc. Olympia-as-a-city isn't even completely in the district. A good portion of the NE part of the city is in the neighboring 9th, along with a good portion of the rest of urban Thurston County. Olympia and Vancouver are the two liberal bookends to a district that is mostly Republican (aside from Grays Harbor and Pacific County, but they elect a different sort of Democrat). But, Olympia is not in the gravitational pull of Vancouver, and it'll be troubling to watch how we're pulled into and possibly muted in this election. So, what are these political differences that I vaguley refer to that separate Vancouver from Olympia? 1. General garden variety "I live so close to Oregon" issues. If a big city like Vancouver didn't exist in the 3rd, these wouldn't crop up because you wouldn't have a large enough constituency that wanted to shop tax free. Or, go to school in Oregon, or want to treat Oregon like it was part of Washington or vice versa. 2. Columbia River vs. Puget Sound. Both are big natural resources arenas with different issues. Which gets your attention, which gets the money? 3. Evergreen State College vs. WSU Vancouver. Even though Evergreen was established with at least the partial mission of being the 4 year institution that serves Southwest Washington, one could argue WSU Vancouver now either actually fills that role or competes very closely with it. Although it has about half the enrollment of Evergreen, it is much closer to the region's population center and has a more mainstream brand. What would serve you better as a congressman? Building up WSU Vancouver or Evergreen? 4. Transportation. How we get to Seattle vs. how we get to Portland. I think you overstate the situation. Yes, Clark County will be the main battleground in this election, as it is home to both all the major candidates and 50% of the voters. But Thurston County will be a secondary battleground, not irrelevant. Thurston has 20% of the voters, and an disproportionate number of strong Democratic voters. A Democratic candidate ought to think carefully before ignoring us. In fact, with so many candidates, if the top Democrats more or less run even down south, Olympia may decide it. Also, campaigns are capable of targeting their message to different areas, even different voters. Thurston County voters may well hear about how each candidate feels about Puget Sound, Evergreen, transportation to Seattle, etc., even if Clark County voters don't.